McCain Slams Air Force. A Vietnam veteran, Navy pilot, and long-time Senator recently took aim at Air Force brass for their handling of the A-10 controversy. Read (and watch the video) more in "McCain slams USAF chief Welsh on A-10 effectiveness", Air Force Times, March 3, 2016. 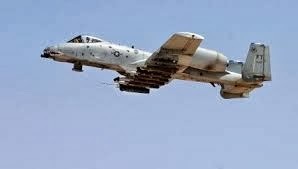 Retire A-10? Hell No. Service leaders claim the decision to retire the very effective CAS aircraft is based on cost and effectiveness. Some critics say that a close analysis of the data says otherwise. I agree. Read "The Air Force's Argument for Retiring the A-10 Makes No Sense", Defense One, March 5, 2016. Video - Army Budget Testimony. General Mark Milley and the Acting Secretary of the Army recently testified on March 3, 2016 before the House Committee on Appropriations on the Army Budget. You can watch the 1 1/2 hour long video on YouTube.com posted by House Committee. SOLLIMS Sampler - "Building Stable Governance". The Peacekeeping and Stability Operations Institute (PKSOI) has published the March 2016 issue of SOLLIMS and there are several articles about governance in Afghanistan that could be of interest to some. Coalition Operations. Mark A. Carter, a government civilian employee of DoD and retired military, provides his thoughts on the challenges faced by Geographic Combatant Commanders when operating as part of a multinational force and makes some suggestions to improve multinational and interagency operations. Read his analysis in "Future Conflicts: The Risks and Rewards of Coalition Operations", Small Wars Journal, March 4, 2016. SOF Mag - Online Only. The print magazine Soldier of Fortune, established in the mid-70s is ceasing print operations and will be available online. Read more in "The Greatest Mercenary Magazine of All Time is Folding", by Adam Linehan, Task & Purpose, March 1, 2016. Closing Bases? The military would love to cut down on the number of bases across the country but it runs into opposition from Congress. Read more "Latest DoD plan to close U.S. bases gets mild response in Congress", Military Times, March 3, 2016.